....mind? Yeah, sometimes. But this time the title is about a book. More about it later. Every year, in honor of our first grandchild Caleb's brief life, we (along with many other family and friends) buy a book to add to his library, shared by Charlotte and Levi. This year, we purchased a book that came highly recommended by my friend, Maggie, who has a 4 1/2-year-old grandson, Tyler, an avid booklover. 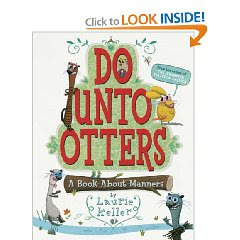 The book was "Do Unto Otters," a book about manners. Laurie Keller is my new favorite children's author. This book is really clever and teaches a good lesson on the Golden Rule with the cutest illustrations. 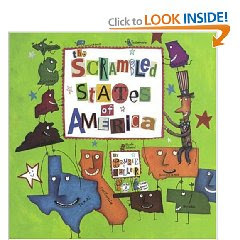 On the cover of the book it says "From the author of 'The Scrambled States of America.'" Doesn't that sound intriguing? I thought so too. So at Barnes and Noble today, I checked it out. This book will stay at Grandpa and Grandma's house. It is the most amusing book about the state of Kansas waking up one morning feeling quite unhappy. Nebraska (a very kind state) wonders what is wrong. "I don't know," moaned Kansas. I just feel bored. All day long we just sit here in the middle of the country. We never GO anywhere. We never DO anything, and we NEVER meet any NEW states." So they organize a party where all the states can meet each other, and then switch places. I highly recommend it. It made me laugh out loud. So if you are feeling scrambled, or just bored, or know a child who might enjoy learning about the states in a really fun way, I highly recommend this book. Even the cover is funny! Shut up!--I've met and had dinner with Laurie Keller. When I had considerably more free time, I used to volunteer at a local public library where she once came and did a children's program. She is totally lovely and down to earth. They look great, and I will have to check them out. Literally, from the library! I also found/discovered a GREAT book that is tons of fun called "The Mixed Up Alphabet" - or something similar. It's from Z's perspective of always being last so they re-organize the alphabet backwards. The Scrambled States of . . . book reminded me of that. Thanks for the tips on the books. I think it's great that there is a library in Caleb's memory! I'll definitely have to check into that Scrambled one. I'm a wee bit jealous of "K" who met and had dinner with Laurie Keller. She sounds seems like she'd be a hoot!